Our V-Trec High Performance Motorcycle Lever Set is extremely high quality, replacing the original Lever Set. The original levers of a motorcycle are usually very simple. They usually consist of low-cost cast aluminum, are often not within reach and boring in appearance. V-Trec brake and clutch levers are the perfect addition to your motorcycle. Your machine will be significantly upgraded in terms of precision, ergonomics and handling. V-Trec lever sets are the ideal replacement for the original lever of a motorcycle because they are superior in many areas. V-Trec levers are milled from high quality aluminum, which means low weight with high strength. The grip width is adjustable and can be adjusted in six steps. This allows individual adjustment of the lever to the driver's hand. V-Trec levers are TÜV tested and have a general operating permit (ABE), which allows them to be driven without any problems and without registration. Supplied in pairs with adapters for brake and clutch. Find in our wide range of your new brake and clutch lever. 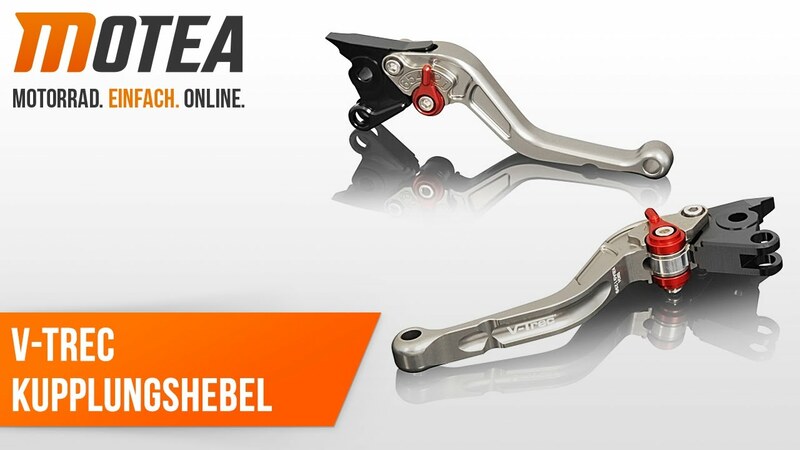 In the assortment of our online shop we carry especially high quality CNC milled brake and clutch levers made of aluminum. The variety of models is seemingly limitless: There are the aluminum levers in various designs: short, long (normal version) or in the safety version. These special levers are hinged to prevent the risk of a fall in a fall. The levers can be customized by freely choosing the color of the lever and adjuster. So they are not only a technical but also a visual highlight of your machine. You can choose between short or long levers. The short version is 14,5 cm long and the long levers about 17,5 cm of length. Compared to the standard levers, our long version is still 2 cm shorter and the short levers about 5 cm shorter. For lever and control you can choose between eight different colors. Our Foldable Levers by V-Trec meet an important safety requirement. By means of the integrated hinge the levers fold in case of an accident in order to diminish the danger of breaking or bending. Apart from individual color selection, the lever reach can be sixfold and smoothly adjusted to fit your preference completely. Our Length-Adjustable V-Trec Levers is infinitely variable in length and can be adjusted accurately to a millimeter. You can thus change in between two-till-four-finger control and adjust the length accordingly. If you want to be flexible with your lever length, our Length-Adjustable V-Trec Levers are just the right choice for you. The Foldable and Length-Adjustable Levers unite all advantages of our V-Trec Levers and can be adjusted completely to your preferences. Lever reach (distance between lever and grip) is adjustable by the control. In addition, the length of the levers are infintely variable. Foldable and Length-Adjustable Levers provide comfortable and ergonomic handling. Choose a color for lever, end piece, and control respectively.